Do you want to bring Ubuntu 11.04 Natty Narwhal into your windows 7 Desktop? with Ubuntu skin pack you can do it easily to make your windows 7 desktop like Ubuntu 11.04 Natty Narwhal. Ubuntu skin pack is free skin pack for windows 7 (it also available windows XP version) created by “HamedDanger” that published in deviantart website. With this skin pack you can do easily transform windows 7 desktop and make it Ubuntu natty narwhal like. This skin pack support for windows 7 32bit and 64bit version and also support windows 7 with service pack 1 (SP1). No matter what your windows 7 language version because this Ubuntu skin pack support for all language version of windows. Ubuntu skin pack change almost all windows 7 theme setting. The setting changing: Login Screen, Ubuntu Start Button, windows icons, adding Ubuntu theme sound, change window login screen and more. After download finished install the skin pack and follow the process until installation finished. After installation process finished restart your computer. You’ll enjoy Ubuntu Natty Narwhal in your windows 7 after login to your windows 7 desktop. 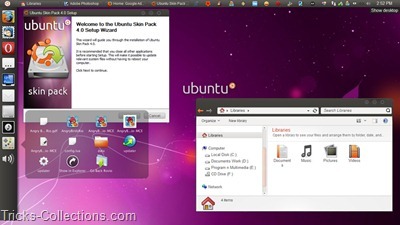 This Ubuntu skin pack pack is a good Ubuntu transformation software for windows 7. And similarities the Windows 7 desktop with Ubuntu 11.04 Natty Narwhal desktop after transformed using this software is about 97%. Related to "How to Make Windows 7 Desktop Look Like Ubuntu 11.04 Natty Narwhal"